Tom Kenny Skip Hire offers a variety of different skip sizes and types to meet your requirements from 6 cubic yard skips to 14 cubic yard skips. We deliver and collect hired skips and have keen skip hire prices. Tom Kenny Skip Hire serves both commercial and domestic customers and welcome accounts from all trades. To request a competitive quote, or for friendly, helpful advice please contact Tom Kenny & Son Skip Hire. THE HIRER IS LIABLE FOR ALL LOSSES & DAMAGES TO OR ACCIDENT INVOLVING CONTAINERS WHILST ON HIRE TO THEM. NO TYRES, NO ASBESTOS, NO FRIDGES & NO FREEZERS IN SKIPS. WHERE THE SKIP HAS TO LEAVE THE PUBLIC HIGHWAY AT THE HIRER'S REQUEST, ANY DAMAGE TO PAVEMENTS, GATES, PATHS, ETC., SHALL BE THE HIRER'S RESPONSIBILITY. 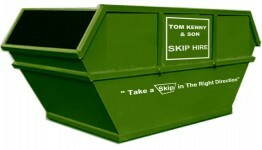 PLEASE RING TOM KENNY & SON SKIP HIRE WHEN THE SKIP IS FULL. FIRES ARE NOT PERMITTED IN OUR SKIPS & SKIPS CAN ONLY BE LEVEL FILLED.